• run as close to 100 miles as possible (at least 90) – FAIL, I only ran 81.5 miles. • strength train twice a week if possible (might not be possible while I’m on vacation, but I do plan to take my TRX straps and BOSU ball with me in case I can’t make it to the gym) – FAIL, I didn’t strength train at all while on vacation and I think I only went once a week for strength before I went on vacation. • maintain my weight…don’t gain…stay under 180 – BIG FAT FAIL…I gained. • run as many trails (including a run on the beach!) as I can while on vacation (instead of doing all my runs on roads/paved paths) – SUCCESS!! I ran the beach and a trail in the forest. • come up with a new plan of attack for May for eating and exercising – SUCCESS! So, yea…April wasn’t too great with the goal achieving for me. However, I think I learned some things. Until I promote at work and/or pay off all my credit cards, it’s going to be an ongoing struggle to get to the gym twice a week for the purpose of strength training. Running is definitely my priority when it comes to fitness activities. I’m not super upset about my monthly mileage. I was under my B goal of 90 miles, but I still did over 80 and that’s still nothing to sneeze at. Also, I think I’m still over the minimum average of monthly miles to be on track to hit 1000+ for the year and that’s what really matters in the long run. HA! The long run! I didn’t even mean to do that! Not only did I not try to find a gym to do some strength training at while I was on vacation, I didn’t even use my BOSU ball that I made a point to take with me on the trip! Ugh! I need to start that back up. The arthritis in my left elbow bothers me less when I do load bearing exercises that involve my elbow (like pushups). And it’s been hurting a lot since I went on vacation and haven’t been doing my BOSU exercises. 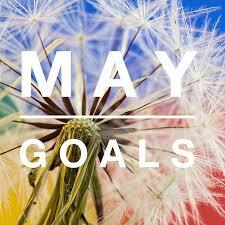 Okay, onto my goals for May. Or maybe I should start calling them “hopes” instead of goals? Either way, here we go! I think that’s good for one month.